11/22/63 – Stephen King on JFK | brainsnorts inc.
Reblogged from a ways back – for obvious reasons. Two of the most controversial and never-endingly (?) discussed items in the last 50 years can each be summed up with three letters. UFO and JFK. Stephen King has written about many things, and although I haven’t read anything he may have written about UFO’s, he did manage to take a crack (no pun intended) at JFK. I hope that doesn’t trigger and Secret Service visit. Before we even get into the book, let’s be clear about two things: time-travel stories are stupid, and I love time-travel stories – when they’re well done. The reason they’re stupid is because the device is never believable and always seems silly, and none is sillier than the one in 11/22/63 (849 pages) by Stephen King. In King’s most recent book, high school literature teacher Jake Epping learns about a time portal. Unfortunately, it seems the only time he can travel to is Lisbon Falls, Maine, on September 9, 1958, at 11:58 a.m., about five years before JFK’s assassination. Harry Dunning, the owner of a local diner, finds this portal in a supply closet behind his kitchen. Despite all the amazing things one can do with a time portal, Dunning uses it to take advantage of the 1958 prices of ground beef, buys mega-pounds of it to make burgers in his present day, because isn’t that what we’d all do with a time portal? Go back, buy ground beef low, come back home, and sell high? I mean, he must have made just dozens upon dozens of dollars. I’m just glad his scruples prevented him from betting heavily on maybe the ’58 World Series or what is considered by many to be the greatest NFL game ever played, when the Colts beat the Giants in overtime to win the ’58 championship. Nah, the beef market is the way to go. The problem is Dunning is sick. Not just sick of buying beef but terminally ill, and after wasting all his time with burgers, he’s come up with a better use for the time portal: stop Lee Harvey Oswald from killing JFK. Dunning rationalizes that the death of JFK caused the death of Martin Luther King, Jr., which ruined the peace and civil rights efforts, which also caused our involvement in the Viet Nam War, which all caused the deaths of millions of Americans. Dunning believes that saving JFK will not only save millions of lives but put us on a more righteous path that would greatly pay itself off in present day. Of course there’s a catch – what if Oswald didn’t do it? But of course there’s a catch to the catch – Oswald allegedly took a shot at Edwin Walker, a retired army general, several months before JFK was shot. If Jake can go through the portal to 1958, then just lay low for about five years to see if Oswald really did take a shot at General Walker, then that’s enough to erase any reasonable doubt regarding Oswald killing JFK. Thus, take out Oswald before 11/22/63, save JFK, then dance back to present day, and watch the world improve overnight. Dunning gives Jake some advice. First, don’t attract attention to yourself. Jake clearly follows this when he buys a rather flashy ’54 Ford Sunliner convertible, passes out business cards claiming to be a real estate agent, becomes a very popular high school drama teacher without any teaching credentials, and lays down a such a big, winning bet with a mob-connected bookie that he gets beaten, hospitalized, and his house burned down. Incognito, for sure. Another great effort to stay on the “down low” was when he told two kids that he was probably going to kill someone and then kills someone. Good thing those kids don’t read newspapers or they might have turned him in. Oh, and about the expensive convertible, Jake of course needs money to subsist for five years. Stop me if you’ve heard this one, but Dunning gives Jake a book with sports scores in it so that he can place bets in case he needs some extra money. Very original. 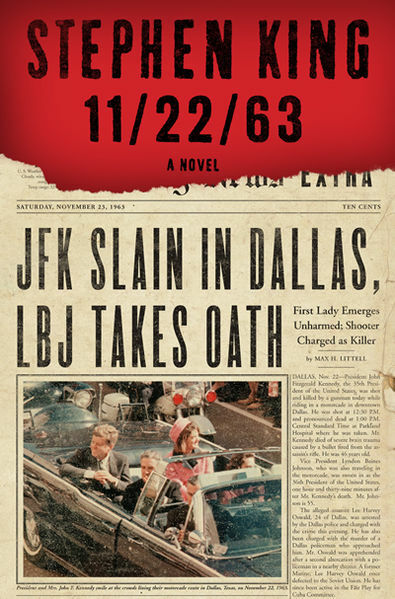 Out of the 849 pages in 11/22/63, only about 200 have anything to do with the JFK part, and that’s the biggest disappointment. The JFK controversy is a big – frigging – deal. So if you’re going to write a story about it, then please write the story about it. In this case, however, the bulk of the story is either about Jake’s romance with a high school librarian and King’s eagerness to prove how much research he did about the time period with reference upon reference of cars, food, prices of random items, and other nostalgic nonsense. Endless pages and chapters are spent in episodic fashion as Jake trudges through five years to finally get to the day of the assassination, and that’s not easy. As Dunning explains, the past is “obdurate,” and it does not want to be tampered with, nor does the vocabulary of a diner cook. Several times, Jake barely escapes a runaway truck, life-threatening injuries, amnesia, and a bus that seems to have been sent by “the past” to prevent him from stopping Oswald. On the day Jake needs to see if it’s really Oswald who takes a shot at the general, it seems one roadblock after another springs up from nowhere, and the same happens at about the same time that Mr. Zapruder to get his camera ready. Despite those numerous bumps in the road, miraculously, in the minutes before the limousines roll through Dealey Plaza, a very familiar convertible appears before Jake with the keys inside, and he’s practically escorted to the book depository where – nah, can’t tell you that part, but I can tell you a few other things. Any good (and there’s only one) time-travel story has concerns with the “space/time continuum,” also knows as “the things you changed back then and how they’ve affected the rest of us in present day.” Although Jake does make changes in 1963, he does not come home to a present day America full of shiny happy people holding hands. Things are worse, and the efforts to fix what’s worse should have been a more involved part of the story. Instead, it’s glossed over with a cheap trick that defies the very logic that King used for his time portal. I’ll explain that with a spoiler right now. So – spoiler alert!! I said earlier that each time someone uses the time portal, they appear in the same place and time. What also happens is that everything one may have changed on a previous trip to the past gets erased and reset. So if one went into the past and chopped down a tree, they would come back to the present and find that tree still gone. But if you went back to the past again, that tree would reappear. Everything that gets changed in the past is “reset” once you come home and then visit the past again. This allows Jake to very easily reset all that he screwed up when he returned to the present from 1963 to find a chaotic America. A quick trip to 1958 and back and the chaos was erased. That was easy. A good plot not only involves chaos but also the work needed to fix it. We all know that in 99% of the fiction we read, the protagonist is going to win and get what he or she wants. We know that going in, but what we don’t know is how. Just how will it happen? That’s what we stick around for, what we read for. We know Darth Vader isn’t going to rule the universe, and we know farm boy Luke Skywalker is going to defeat him, but we want to see how, and that’s why we turn the pages. That’s where King messes up with 11/22/63, he doesn’t get the “how” right. Watching Jake work his way through the stuff that soap operas are made of for five years is quite annoying. Then, when he does what he does in Dallas on November 22 and comes home to find one hell of a mess, he conveniently has a reset button as if the world was just a Nintendo game, and everything is back where it was again. That aftermath, trying to fix what he screwed up, that would be worth following Jake for five years as he tried to reverse what he did wrong. I’ve said before that I enjoy King’s short stories way more than his novels. This should have been a short story. The five years in the past were nothing more than King showing us how much research he did about the years of ’58 to ’63, and even there he screwed a few things up. Jake is much younger than Dunning and isn’t very aware of what Oswald looks like, so Dunning gives him a notebook full of facts and pictures. Yet Jake is able to instantly identify a certain car as a ‘54 Ford Sunliner. There are other inconsistent moments, but they’re not important enough to list. When you write over 800 pages, they can’t all be expected to hold water. But getting back to the short story angle, it would have improved this and saved me from listening to 30 CD’s. The problem with that, however, is that Jake would have had to have been able to pick and choose when he appeared in the past, and that’s not easy to do without a flux capacitor. 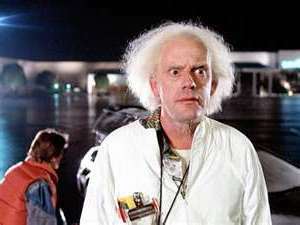 Speaking of the flux capacitor, the only worthy time-travel device – this book uses a closet. No, really. It seems all you have to do is go into this closet, shut the door, and pretend you’re walking. Yes, just lift each leg and put it down again as if you’re walking up stairs, and after about five strides, there will be a step, then another, then another, and then it’s 1958. That’s all there is to it. 849 pages worth. I like time travel stories. More in movies than reading. I was a big fan of Stephen King in the 70’s & 80’s. This was the best book of his I read in a long time. I don’t know I took this book at face value. Yes I expected more of JFK and Lee Harvey Oswald but I accepted the five year waiting period for the plan to be executed. I guess I enjoyed the love story aspect of the story. In King’s defence he is a character writer. When we finish his book we know the characters intimately. Did you read “under the dome”? I did not, but the biggest King fan I know was disappointed by it. countdown is on for the tardis. my kid is ready and waiting. There is so much you could have done with a portal to 1958, like buying shares of a company that went up by a lot (Warren Buffet’s Berkshire Hathaway stock price increased by a factor of several thousands), buying gold, art, selling a future computer chip design, buying land where oil or other valuable minerals will be found, “finding” in 1958 buried treasures that were found later, and so on. You could also try to stop Oswald by hiring someone (or few people, just to be sure) from 1958 make a anonymous call to police or Secret Service in 1963. Buying ground meat which passed 1958 safety standards but not necessarily today’s? Pffft. Sorry this book didn’t do it for you. I think it’s King’s best work. (That’s coming from a fairly big King fan.) I know you’re not alone in feeling like much of the book became tedious with all the side roads in the plot. That sort of meandering is a bit of a hallmark of King’s. I enjoyed every bit of it. It made me want to go back in time. i love time travel stories, and there is a great romance in here, very enjoyable, but the story could have been trimmed down from nearly 900 pages. Off topic … a lot on my plate, so I haven’t been around as much … I hope you have a good Thanksgiving … and hopefully some time with your kids. Thanks for your writing and visits!!! Thanks….. but I won’t be seeing your kids. likely not. did you see BB today? slowly surpassing AK. Didn’t see anyone today … too much time at the hospital (MIL) and errands. But now I’m sorry I missed it! sorry about hospital. not that it comforts nor compares, but i’m going to a service friday. my favorite aunt who treated me like her own son, better than her own son, when i was a kid. also, i hope you get to read my next post. i don’t even know how to describe what i experienced monday night through tuesday morning, but i’ll type it up as best i can. best wishes and flaky pastries to you and yours. My condolences to your loss. No loss is easy, and there’s never good timing. Then toss in the fact that each of us deal with it differently. My you find strength and peace of mind in the bountiful good memories. that’s a very nice, pleasant thing for you to say. thanks very much. You know, the thing is, I would have enjoyed the meanderings through the book, just not that many pages worth. King has always done this. I have enjoyed many of his novels, but the hardest thing I have to do is start one. I take a look at 500-1200 pages and think, “I could read 2 Dean Koontz novels here.” And, I usually do. I love short stories even more – horror short stories are usually better than novels in my opinion. You get the scare quickly and can go on to another. Just my thoughts – great post.